The Instructor will work closely with both the Troop Guide and with the Assistant Scoutmaster for new Scouts. 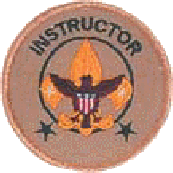 The Instructor does not have to be an expert but should be able to teach the Scoutcraft skills needed for Tenderfoot, Second Class, and First Class ranks. The troop can have more than one instructor. Teaches basic Scouting skills in a troop/team and patrols/squads.